Rather than reflections on the week’s Lectionary readings, I would like to suggest that we talk with our children about the heroic and loving efforts of Antionette Tuff last week. She is a school clerk in Georgia, and was at the front desk of her elementary school when a young man walked in with several weapons. She talked with him and was finally able to get him to put down his weapons and surrender to police. You can hear her talk about the experience here. We may hesitate to even bring up situations of school violence with our children for fear of scaring them, but many schools now have drills to prepare for such events. They have fire drills and tornado drills and armed intruder drills. Many children may already be frightened, and this story gives us an opportunity for gratitude and hope. Jesus teaches that we should treat every person with love and respect. Often people who do harmful things are deeply hurting themselves. When we are scared, we can still act in love. When we are scared, we can take comfort in the words of Scripture, the teachings of our church, and we can go to God in prayer. The way of Jesus means that we do not run away or fight back, but we reach out in love and try to make peace. God, thank you that Antoinette Tuff showed your love and acted in your wisdom last week when an upset man came into her school. Thank you that everyone stayed safe. Please help us to show your love to all people. Give us wisdom to walk your path of peace. Amen. Tags: Antoinette Tuff, devotion, family, peace, prayer. Bookmark the permalink. Wonderful blog post! Thanks so much. 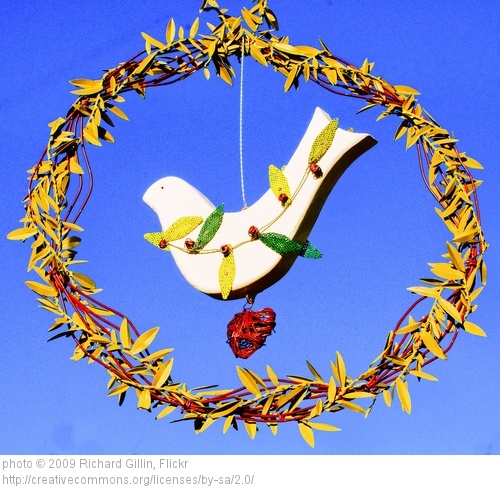 There’s a wealth of resources for learning and training as peacemakers in Mennonite Central Committee’s new Peace Sunday packet: http://mcccanada.ca/peace/peacesunday. This year’s resource is full of stories that can be used in the home as well as in church.